David Ekserdjian stated the painting ‘Girl with a Flute’ to either be by or after Bernardo Strozzi (1581–1664), because same female figure, flanked by two male musicians, appears in a composition by Strozzi, which is known in a number of versions. Kirklees Museums & Galleries did not have any more information, but an old label on the back said ‘Verspronck’, pupil of ‘Frans Hals’, with the hint of a signature. NICE attributes it to the Flemish School. Toby Campbell agreed it is either by Strozzi, or a copy after him, but definitely not a ‘Verspronck’. Al Brown concured, and added it lacks Strozzi’s tenebrist brushwork, in the fingers. There was a call for a higher resolution image to examine. Tim Llewellyn confirmed the Strozzi connection, but reports on its conservation. Richard Green inspected the painting personally at Huddersfield Art Gallery, and found no condition problem, but a misleading digital image. The tonality is closer to Strozzi’s work, particularly the face, but hands, connection between neck and head shows poor understanding of structure, and maybe the work of a copyist. Further evidence reveals the painting was in Christie’s London sale, 20 July 1906, catalogued as 'Dutch school: a shepherdess playing a pipe', but unsold. Since it proved impossible to produce an improved digital photograph of Girl with a Flute the discussion was closed, with the attribution changed to ‘after Bernardo Strozzi’, which Grant Scanlon at the Kirklees collection was happy to accept. The painting is now listed as being after Bernardo Strozzi (1581–1644). 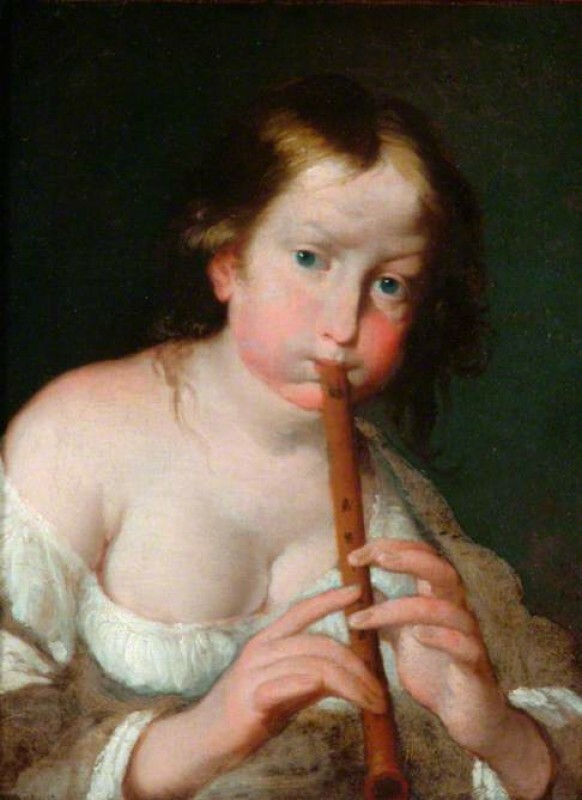 Could 'Girl with a Flute' be by – or after – Bernardo Strozzi?